Bake, brown and roast with confidence with OXO’s Oven Thermometer. A frosted glass back panel allows the light in the back of your oven to shine through the Thermometer, illuminating the large numbers and making them easy to read. The easy-to-use clip lets you hang the Thermometer from any oven rack or stand it on top of the rack. In either position, the clip fits securely on the oven rack to prevent the Thermometer from falling when food is moved in or out of the oven. Calibrated for accuracy, the OXO Good Grips Oven Thermometer features Fahrenheit and Celsius temperature scales for increased convenience. For tender turkey, perfect pork and the best beef, try OXO’s Meat Thermometer. Turn the outside double indicator until it points to both the safe internal temperature and the name of the meat you are cooking. 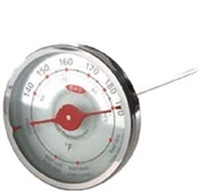 Insert this leave-in Thermometer into your meat away from the bone and leave it in during cooking; when the dial is aligned with the double indicator, your meat is done. The Thermometer’s probe is long to reach the center of large roasts, and narrow to minimize the hole in your meat. A frosted glass back panel allows the light in the back of your oven to shine through the Thermometer, illuminating the large numbers and making them easy to read. Calibrated for accuracy, our Meat Thermometer features Fahrenheit and Celsius temperature scales and readings for poultry, beef, pork, veal and ham for increased convenience.